Apprising Ministries, an online apologetics and discernment labor in the Lord, is doing what we can to help you see the dire consequences now occurring in the church visible after years of corruption stemming from the semi-pelagian (at best) the Church Growth Movement, which was spewed out of Fuller Theological Seminary circa early 1970’s. Leadership Network, another travesty infecting the Christian community, was then instrumental in developing the Purpose Driven/Seeker Driven movement ala PDL Pope Rick Warren and the Emerging Church movement ala gay-affirming universalist Doug Pagitt within mainstream evangelicalism. Now, as evidenced by Fuller Seminary Promoting Emerging Church Heretic Doug Pagitt and Fuller Theological Seminary Professor Tony Jones And Christian Spirituality Cohort, consider just how far FTS is off the rails. It is quite literally advancing the skubalon of the spiritually deadly duo of Pagitt and his progressive/liberal theologian in residence Tony Jones, two-thirds of the apostate EC trinity along with Living Spiritual Teacher and EC guru Brian McLaren. Ok, before one plays the guilt-by-association card because I mentioned McLaren, you need to know that guru McLaren is personally involved with this FTS cohort along with the Empress of Emergence Phyllis Tickle. It’s hard to get evangelicals exercised about any point of doctrine nowadays. To scold them for supposedly overreacting at the rankness of Bell’s damnable heresy strikes me as counterproductive—dangerously so… Perhaps the main deficiency in the Reformed blogosphere’s response to Bell’s universalism is the speed with which the scandal blew over. Sadly, today Rodney King theology rules; due to a growing dry and dead orthodoxy within mainstream evangelicalism, and after years of EC teachings being used in Young Adult and Youth Ministries, sparks from corrupt Contemplative Spirituality/Mysticism have been fanned into flames among its younger sectors. Unfortunately, evangelical leaders remained silent while EC teachers began to be published in evangelical publishing houses, which has now opened the door for neo-Gnostic mysticism right into the heart of the Christian community. This is painfully obvious from articles like In Touch Magazine Of Charles Stanley Promoting Contemplative New Monasticism and Mainstream Evangelicalism Embracing Contemplative Mysticism. You need to know that as a direct result of all of this our time is going to be one of growing confusion as spiritual darkness falls upon apostatizing evangelicalism. A few years ago I covered this apostasy in more depth in The Falling Away of the Evangelical Church. And sadly, this is what the Lord is saying to so many leaders within the evangelical camp — “But I have this against you, that you have abandoned the love you had at first. Remember therefore from where you have fallen; repent, and do the works you did at first. If not, I will come to you and remove your lampstand from its place, unless you repent” (Revelation 2:4-5). This is the sad fact of this characterless generation: In recent years, for whatever reason, God’s message of salvation has been tragically altered. And a new brand of seeker sensitive Christianity has emerged, which Dr. John MacArthur dubbed “Christianity-Lite” in his book Hard To Believe. If you listen in the Spirit you may hear the Word of the Lord along the lines of, “Men have compromised My message; supposedly in their attempt to make My Gospel more appealing to unbelievers. But what they ended up doing—the real reason why they have done so—was to make life easier and more comfortable for themselves, and in order to justify their own lack of faith and commitment.” And in time, because people weren’t studying to show themselves approved, this user-friendly “easy-believism” became accepted as if it is what the Bible actually teaches. Do you remember this — Now these Jews were more noble than those in Thessalonica; they received the word with all eagerness, examining the Scriptures daily to see if these things were so (Acts 17:11). Well, please do search the Bible to see if what I say is true; for it’s our hope that all of us will be doing what Christ asked each of us to do when He literally comes again to His earth. It’s upon this terrain we must now tread as we talk further about the inroads made into the very heart of the visible church by the Emerging Church 2.0, which claims its “big tent” postmodern Progressive Christianity aka Emergence Christianity is the historic Gospel of Jesus Christ bringing His kingdom to the earth now. 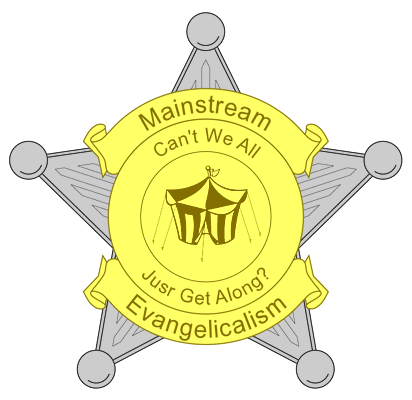 I told you in The Wild Goose Of The Emerging Church Is Not The Holy Spirit that, God be praised, a comment of mine from my piece The Emerging Church On A Wild Goose Chase—where I told you about the EC apostasia-palooza called the Wild Goose Festival(WGF)—received quite a bit of play around the blogosphere. Specifically what I said was that the wise Christian will have nothing to do with these neo-Gnostic fools who’ve unbuckled themselves from the Word of God and have embarked upon their Wild Goose Chase of subjective experience. This is the heart of the matter before us: Once you begin using personal experience to interpret Scripture you’ve entered a form of Gnosticism. You’re doomed to subjectivity [read: guessing] as to what God is saying/doing, which is eventually going to lead you to shipwreck upon the rocks of spiritual deception, because now you have no objective standard (i.e. the Bible) to test these experiences by. Look what CSM did to the Roman Catholic Church; much of its monastic traditions would embrace the crown jewel of CSM, which is a form of meditation in an altered state of consciousness commonly known as Contemplative/Centering Prayer (CCP). Years of delusion followed as mystic dreamers rose through the ranks of the RCC spreading their mythology until CSM played a major role in producing apostate Roman Catholicism leading to the Lord sending His Reformers. As it swallows up more and more of your evangelical young, here’s what you need to grasp when it comes to dealing with the neo-liberal cult operating within the Emerging Church. Woefully under-taught from years in PD/SS playpens, indoctrinated to in a phony tolerance, and without the anchor of God’s Word, they are easy marks for EC vipers hissing their pseudo-intellectual postmodern doubletalk while they lure the unsuspecting into their dens of spiritual iniquity. You see, such as these learned well from their evil forebears in the original cult of liberalism. Unbeknownst to them, words familiar to professing Christians are emptied of their original meanings and then carefully repackaged with different ones. Through mentally off-roading these naïve people into the postmodern Wonderland of Humpty Dumpty language EC leaders are able to get them lost in a desert where, as shadows and shifting sands, the meanings of words continue to take on new shapes of meanings. That’s why, before you realize it’s happening to you, you can even find yourself nodding in agreement with such as these who have the appearance of godliness, but [are] denying its power (2 Timothy 3:5). Note the next part of the verse does not say we should sit down and have a conversation with them so we can all get along. No, Jesus tells you in no uncertain terms to — Avoid such people. But why? False prophets are not simply wrong teachers, propagating a different philosophy or alternative theology. They are spiritually dangerous and we should not expose our souls and minds to their perverse, poisonous influence. These purveyors of error and heresy are spiritual beasts and far more deadly than any physical ones. Peter warns that they are “like unreasoning animals…. reveling in their deceptions … enticing unstable souls” (2 Peter 2:12, 13, 14; cf. Jude 10). Therefore, perfectly understanding all this, Jesus’ admonition to “beware of the false prophets” is not merely a mention of something but a warning to be on guard against and keep our minds away from what is spiritually harmful. For the benefit of of His listeners, it was natural for Jesus to compare false prophets with wolves. In Palestine, wolves roamed the landscape seeking to prey upon stray of lagging sheep. When a wolf found a defenseless sheep, it attacked quickly and tore the sheep to pieces. Just like those merciless and ferocious animals, false teachers are always seeking new victims. Jude’s letter warns against false prophets and tells how we can safeguard ourselves against them: “Keep yourselves in the love of God, waiting anxiously for the mercy of our Lord Jesus Christ to eternal life” (v.21). Our first priority is to be right with the Lord, living in a place of divine fellowship and sound teaching. Then we can warn others of false prophets and carefully rescue them from the damning influences (Jude 12-13). John MacArthur, Daily Readings From the Life of Christ [Chicago: Moody, 2008], July 1.